Heat the olive oil a skillet over medium-high heat. Chop the bacon into 1-inch pieces. Add to the skillet and cook for 5-8 minutes until crisp. Pour the balsamic vinegar into the skillet. Immediately scrape the skillet with a wooden (or other non-abrasive) spatula to release the browned bits on the bottom of the pan. 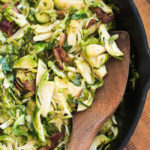 Add the chopped brussels sprouts, stirring to incorporate the bacon. Cook for 8-10 minutes, stirring occasionally.